We've got some smoke coming from the back of Ericsson's Sauber. "Something is broken. Left rear suspension I think - puncture or something," is the Swede's feedback. He's crawling around the circuit. Waiting for a soft tyre lap from Mercs. But the fuel loads still unknown. Ericsson still limping around the circuit. The wheel is looking like it might just come off the car at the moment. Replays show Ericsson getting wide on the kerb as he joins the start finish straight. The problem started immediately afterwards. Grosjean very nearly collected the Sauber later in the lap as well after having a wobble. @DonovanFroon I'm 100% with you on that case, I would prefer a perfect car for each driver. Do McLaren expect KM back for FP2 today ? It'll be a race against the clock to get him out but let's see. @malik: Maybe Maldonado is contagious? 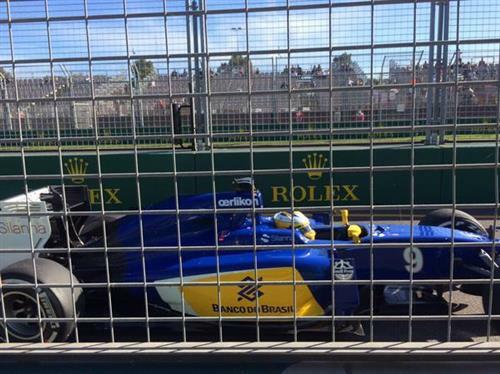 So things go from bad to worse at Sauber as their cars start to repossess themselves. Rear suspension failure on the number 9 car of ERI. Is this season Show-Or-Go for Ericsson ? @timot: I would say so - though who knows how long he could stay in F1 with sponsorship. @p3t3r: Laurence is in the paddock in Melbourne. is there something wrong with massa's car? @oz-f1: Yes, a water leak. Unlikely he'll feature again. @Donovan Giving the front end is not that easy, they have to maintain the rear balance too. Ferrari have already been generous in the rear packaging compared to other teams. So they are trying. @Arvind: True. Plus it was only one line of feedback from one lap - doesn't mean Ferrari hasn't built a car for Kimi. It just means on that lap he wasn't 100% happy. Rosberg's first soft tyre run puts him seven tenths up on Vettel. Hamilton also out there on the yellow striped tyre. Maldonado has another off and it looks like he's cruising after re-joining the track. @Arvind @Nate True! Let's see how the season progresses. With Alonso gone, I am sure it'll be a better environment at Ferrari (Reports, seem to think so at least). Hamilton crosses exactly one tenth down on Rosberg. Maldonado seems to have lost power and he's pitted. Clearly the results are showing us Mercedes had their main priority on reliability of the car. 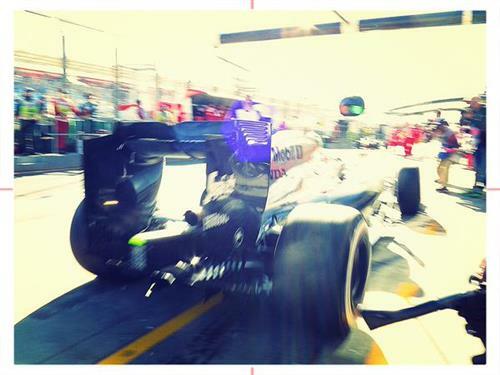 @Questionaire: He's on the soft tyre, currently in the final sector. Looks like Bottas backed off slightly on his current lap, however, and his first lap is nearly two seconds down. Rosberg is two seconds quicker than Mercedes' quickest FP2 time last year. Pretty staggering. @Nate: From the pictures, it looked like Suaber's smoke was coming from the tire. @OuterBongolia: yes it was. Seems the tyre was rubbing against bodywork. How strong or weak are the overtaking chances at Albert Park? @RohanMehta: They're quite good. The run down to Turns 1 and 3 give good opportunities, while there are chances to have a nibble later in sectors two and three. @ctohjohn: Rosberg's headline time is a 1:27.697.
are the top four times all on options?